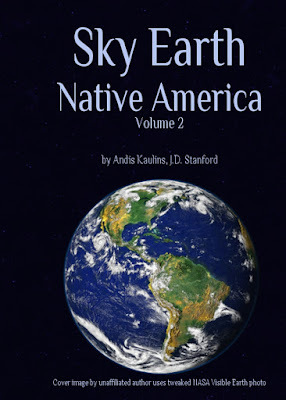 Sky Earth Native America 1: American Indian Rock Art Petroglyphs Pictographs Cave Paintings Earthworks & Mounds as Land Survey & Astronomy, Volume 1, Edition 2, 266 pages, by Andis Kaulins. Publication Date: September 20, 2015. Language: English. List Price: $49.99. Trim Size 7" x 10" inches viz. 17.78 x 25.4 cm. Full Color on White paper. 266 pages. ISBN-13: 978-1517396817978-(CreateSpace-Assigned). ISBN-10: 1517396816. BISAC: History / Americas. Create Space Title ID: 5745812.
page 46 - Hiawatha as Atlas and Orion, the Iroquois Aron-Hiawagon with Hiawagon = Hiawatha, the "Holder of the Heavens"
page 112 - Great Thunderbird Challenge for World's Archaeologists, Astronomers Archaeoastronomers: 1 Petroglyph 60 Stars! page 115 - The State of Modern Archaeology and Astronomy: Thundering Acclaim for the Thunderbird Challenge or Not? The next posting has the Table of Contents for Volume 2 of Sky Earth Native America. http://www.createspace.com/5745812 Sky Earth Native America 1: American Indian Rock Art Petroglyphs Pictographs Cave Paintings Earthworks & Mounds as Land Survey & Astronomy, Volume 1, Edition 2, 266 pages, by Andis Kaulins. Publication Date: September 20, 2015. Language: English. List Price: $49.99. Trim Size 7" x 10" inches viz. 17.78 x 25.4 cm. Full Color on White paper. 266 pages. ISBN-13: 978-1517396817978-(CreateSpace-Assigned). ISBN-10: 1517396816. BISAC: History / Americas. Create Space Title ID: 5745812.
http://www.createspace.com/5745813 Sky Earth Native America 2: American Indian Rock Art Petroglyphs Pictographs Cave Paintings Earthworks & Mounds as Land Survey & Astronomy, Volume 2, Edition 2, 262 pages, by Andis Kaulins. Publication Date: September 20, 2015. Language: English. List Price: $49.99. Trim Size 7" x 10" inches viz. 17.78 x 25.4 cm. Full Color on White paper. 266 pages. ISBN-13: 978-1517396831 (CreateSpace-Assigned). ISBN-10: 1517396832. BISAC: History / Americas. Create Space Title ID: 5745813. Both volumes have the same cover except that one has "Volume 1" on the front cover and the other has "Volume 2" on the front cover. The earth image on the cover was created using public domain space photos of the Earth from NASA. Although this publication is primarily for my own records, there may be a few persons who are interested in acquiring these two volumes. The following two postings after this one present the Table of Contents of each book volume. "Alice Cunningham Fletcher observed in her 1902 publication in the American Anthropologist that there is ample evidence that some ancient cultures in Native America, e.g. the Pawnee in Nebraska, geographically located their villages according to patterns seen in stars of the heavens. See Alice C. Fletcher, Star Cult Among the Pawnee--A Preliminary Report, American Anthropologist, 4, 730-736, 1902. Ralph N. Buckstaff wrote: "These Indians recognized the constellations as we do, also the important stars, drawing them according to their magnitude. The groups were placed with a great deal of thought and care and show long study.... They were keen observers.... The Pawnee Indians must have had a knowledge of astronomy comparable to that of the early white men." See Ralph N. Buckstaff, Stars and Constellations of a Pawnee Sky Map, American Anthropologist, Vol. 29, Nr. 2, April-June 1927, pp. 279-285, 1927. 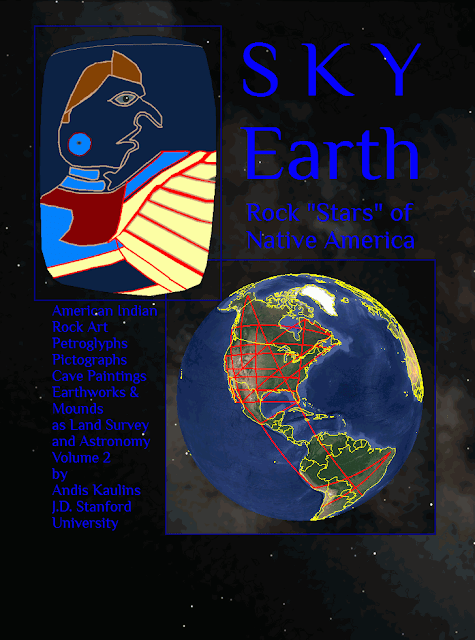 In our book, we take these observations one level further and show that megalithic sites and petroglyphic rock carving and pictographic rock art in Native America, together with mounds and earthworks, were made to represent territorial geographic landmarks placed according to the stars of the sky using the ready map of the starry sky in the hermetic tradition, "as above, so below". That mirror image of the heavens on terrestrial land is the "Sky Earth" of Native America, whose "rock stars" are the real stars of the heavens, "immortalized" by rock art petroglyphs, pictographs, cave paintings, earthworks and mounds of various kinds (stone, earth, shells) on our Earth. These landmarks were placed systematically in North America, Central America (Meso-America) and South America and can to a large degree be reconstructed as the Sky Earth of Native America." "Andis Kaulins is a joint EU and USA citizen, born in Germany in 1946, who received his B.A. from the University of Nebraska in 1968 in English and Political Science and his J.D. (Doctor of Jurisprudence) law degree from Stanford University Law School in 1971. Kaulins is an alumnus associate of Paul, Weiss, Rifkind, Wharton & Garrison, an international law firm headquartered in New York City. Kaulins is also a former FFA Law Lecturer in Anglo-American Law, University of Trier Law School, Trier, Germany, where he taught Anglo-American Law, Legal Research and Legal Writing to ca. 200 students per semester. Kaulins is a co-author of the leading German-English English-German Dictionary of Business, Commerce and Finance, published by Langenscheidt and Routledge, now in its 4th edition in the Langenscheidt version under lead author Ludwig Merz. The other co-author is Dr. phil. Heinz Werner. - Men's Golf Champion at the age of 61 at the Mosel Golf Club, Cochem, Germany"